** This was originally posted in December 2016 ... but scads of material has been added since then. New categories, resources, graphics, recent news items. Additions to this posting are made frequently. It’s become a bit of a dog’s breakfast along the way - because there is just such an over-abundance of information available. Maybe this posting is mostly a jumping off point. Helpful for readers to grasp the true A - Z nature of this complex topic - & be encouraged to set off on some deeper research. HOW THIS POST IS ORGANIZED: The information categories below are in alphabetical order. Some people may be surprised to discover that this topic is so complex & multi-faceted that this is even possible ... that there is just so much to discuss... but as you'll see, there definitely is! Note on March 5/18: I now notice this: while there's a ton of information here (simply tons, & kind of overwhelming, really), I don't bring it all together here in any coherent way. Shoot! But I guess that's what happens when we hive things off into narrow categories. Anyway. Many of the links one might pursue from here will help you to do the sewing together work. & my own site has some of that synthesis stuff, e.g. in the 30 Things You May Not Know About Vaccines posting. I also highly recommend the recent(ish) posting Dear Abigail / Young Mom. [When I posted this...] This is my 11th posting about vaccines in recent months [there are now 30+ postings - to find them go the blog's main page, where they're listed chronologically on the right-hand side, underneath the Quotes selection]. It’s a mix-mash of items, some of them linked to in other postings. As I now know, there is simply an avalanche-worth of material out there about the real risks of vaccines. This is just a smattering, but I hope a useful one! Note: there is much overlap in these categories! Some items/links are relevant (& thus listed) in more than one category. Be sure to scan through the whole alphabet, or you may miss something important. One super-important thing I've learned along the way is that doctors themselves are given very minimal training about vaccines / vaccine science in medical school. There is a graphic that shows the bump-up in the vaccination schedule here in Ontario, where I live. (You can find info about your province from this page on the Vaccine Choice Canada Web site.) Here is the deal in Ontario, bump-up-wise. ** An important note I am adding on Jan. 28/18: please grasp this important point. Not all people involved in questioning vaccine safety are the same. Some are "religious" (even fundamentalist); many are not. Some are climate change skeptics/deniers, or pro-choice advocates (vis-a-vis abortion, I mean); many are not. We are not a homogeneous group of people! We come in all cultures, genders, shapes, sizes, races, religions (or lack thereof), income levels, political affiliations and professions. Nor does every single person you speak to about vaccines agree on all points withIN the vaccine debate. I believe what we all share is the view that it's important to inform ourselves about vaccine contents, efficacy, possible side effects, & safety - and that given the risks we learn about, it is critical that we be given our own choice about whether or not to submit ourselves (and our children) to the inherent risks. I might add that the term"anti-vaxxer" is thrown around a great deal these days. It fails to take into account that many of the so-called "anti-vaxxers" are actually EX-vaxxers. 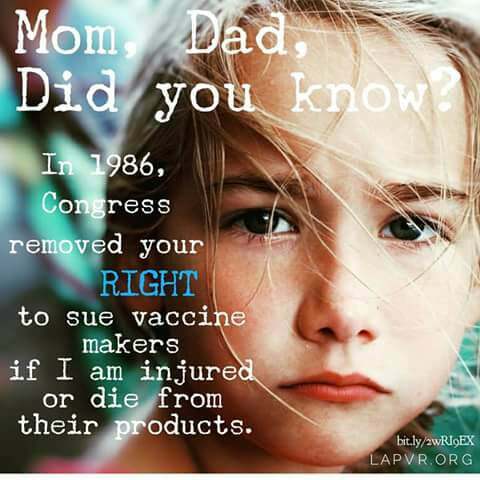 That is, they had themselves (or their child/ren) vaccinated, they (or their child/ren) was or were injured (or died), & now they have educated themselves about vaccine contents & safety. 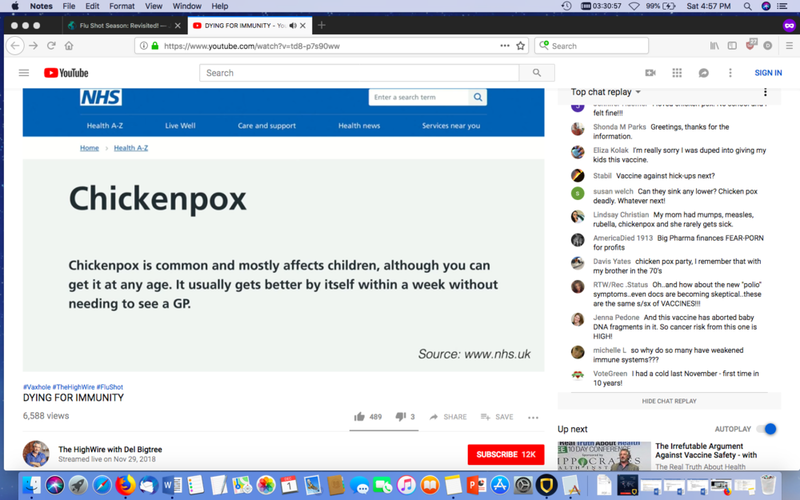 Short YouTube here on the ex-vaxxer phenomenon (2 minutes; this is on Facebook). 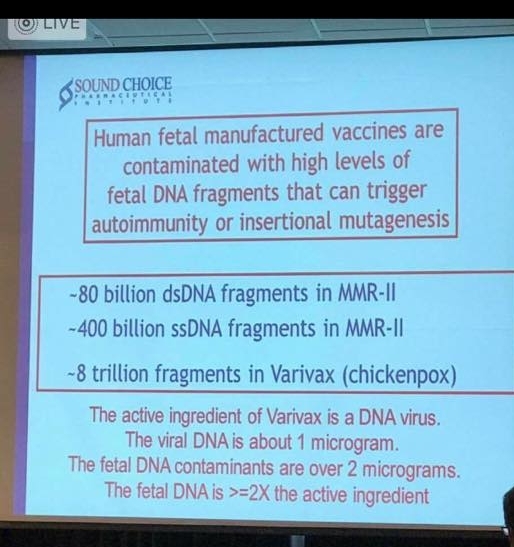 Open Letter to Legislators Regarding Fetal Cell DNA in Vaccines <April 11/19> Note: this item take a moment to load; just be patient! Dr. Theresa Deisher discusses vaccines An interview that covers a wide spectrum of vaccine & autism-related topics, including the use of aborted fetal cell lines, as well as other possible contributors to autism & other negative vaccine health injury impacts. August 2017. So worth hearing! This interview covers a very wide amount of turf indeed (not just the fetal DNA fragments issue), & I highly recommend it. A 2018 interview with Dr. Deisher on stem cell research. 38 minutes, edited. Use of Aborted Human Cell Lines in Vaccines Linked to Rise in Autism (on Health Impact News; looks like it's from 2014). ** As with ALL topics in this A - Z listing, there are many-many other places to find information on this particular aspect of the vaccine issue! Adding it in here is just a way of indicating the existence of yet another piece of the extraordinarily complex vaccine "pie." Allergy epidemic explained! Heather Fraser, author of The Peanut Allergy Epidemic, gives a lecture in January 2018. Explains how long the issue of vaccine-related allergy has been understood (hint: a long, long time), how hard it is to find information (she's a dedicated historical researcher, so she knows how to go about it), why there has been a virtual explosion in allergies among young children since the early 1990s. Easy to listen to & very enlightening! (45-minute YouTube). Deadly Allergy Web site -- Investigating causes and cures of anaphylaxis. Site with many useful links. "Heather has done for allergies what Jared Diamond did for broader concepts of human history in his book, Guns, Germs and Steel. Although she is not a scientist, she used her gift for synthesizing a wide range of scientific disciplines and history to arrive at a simple, coherent, integrated, and common sense hypothesis that, for the first time, convincingly explains the sudden onset of the allergy epidemic. Her theory accounts for its steep rise in America in the early 1990s, and its subsequent movement from western nations into the developing world." Robert F. Kennedy, Jr. in his Foreword to the book. Glyphosate + Aluminum + Mercury = Autism, lecture by Dr. Stephanie Seneff, MIT, on YouTube (January 2018) A much shorter Dr. Seneff item that explains much, here. Dr. Christopher Exley on the Aluminium Age March 2017. Great interview with Dr. Exley, March 2018. 1-hour lecture by Dr. Exley in San Francisco in 2017. Trojan Horses & Cluster Bombs Super-informative, information-dense lecture by Dr. Suzanne Humphries. Rather long, but filled with debunking of claims that aluminum in vaccines is safe. References many scientific papers, some of them very recent. Very worth watching! How to End the Autism Epidemic, by J.B. Handley (released Sept. 2018). A chapter of the book is here. Thousand-Fold Increase in Autism Prevalence since the 1930s July 10/18. 153 research papers supporting the link between vaccines & autism. "Description: Media reports have claimed that there is no scientific evidence supporting the link between vaccines and autism. Here we provide for the reader research that demonstrates links between vaccines and autism, and the mechanisms by which vaccines can cause autism." 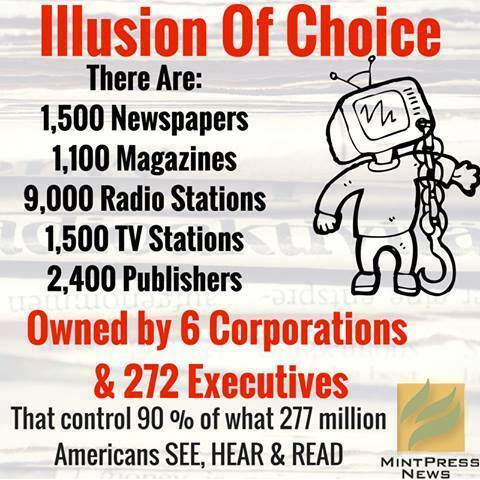 ** see also Lawsuits, Science, Trust ... &, well, this entire A-Z is about Big Pharma, really! BOUGHT – the truth behind vaccines, big pharma and your food Documentary; 2014. Parents of vaccine-damaged children. 2 pharmaceutical industry whistleblowers. Big fines levied against Pharma giants GlaxoSmithKline & Johnson & Johnson. Excellent. (I’ve only seen Part I.) Trailer here. Drug Companies & Doctors: A Story of Corruption NY Review of Books, Jan. 2009: "Recently Senator Charles Grassley, ranking Republican on the Senate Finance Committee, has been looking into financial ties between the pharmaceutical industry and the academic physicians who largely determine the market value of prescription drugs. He hasn’t had to look very hard." The vaccine schedule in Canada is not quite as aggressive as that of the U.S. However, as in the U.S., many more vaccines are being given than used to be the case, & they are being given in multiples (i.e., many different vaccines administered at one time). Doctors do not offer vaccine product inserts, & if you do obtain them & look them over, you're liable to be (appropriately) horrified at the possible side effects mentioned. Nor will your doctor inform you that giving so many vaccines at one time is not safe. In addition, we do not have a coherent vaccine injury reporting system in Canada, nor can parents sue for compensation if their child is vaccine-injured (I believe the situation in Quebec differs from the other provinces). To put it plainly, there is no justification whatsoever for complacency vis-à-vis the vaccine situation here in Canada. To find out what vaccines are administered (or recommended) in Canada (this varies from province to province), go to this spot. Very disturbing at present is the (very) aggressive push by the educational system to bully parents into having their children vaccinated - even threatening suspension of children who are not "up-to-date" on the vaccination schedule. Vaccinations are not mandatory in Canada. Caveat Emptor: Science vs. CDC on Scary Flu Shot Promotions (from World Mercury Project site, January 29, 2018). Flu shot promotion, deaths this year, big risk & low efficacy, vaccine programs suspended in Australia & Italy, flu misdiagnosis, etc. Must-read! Fraud at the CDC. Whoa. What a tale. For more, please go to the Vaccine Choice Canada site, find the Search bar (lower right) & put chickenpox in it to locate several articles. “The greatest crisis that America faces today is the chronic disease epidemic in America’s children.” – Robert F. Kennedy, Jr. Tons of resources on this site! Check out the main page. Fabulous collection of articles here. Dirty Vaccines: Every Human Vaccine Tested Was Contaminated With Metals and Debris in New Study (Feb. 2017) The study is here. Brave Dr./medical school professor (who teaches medical ethics & is risking his job to speak out) talks about vaccine risks, 12 children he knows who have autism, vaccine court (paying out $200 million per year for supposedly "safe" vaccines), various vaccine risks/injuries/impacts (to people of all ages, not just babies & children), vaccine contents we are not aware of, the need for informed consent/choice, the need for housecleaning at the CDC (Centers for Disease Control). & why it's all happening (Big Pharma pressure). & why many doctors do not speak out. 15 minutes. Please watch! Combining Multiple Childhood Vaccines is NOT Safe, According to Article in Journal of American Physicians and Surgeons (Summer 2016). The article itself is here. Dissolving Illusions - Disease, Vaccines, and the Forgotten History, by Dr. Suzanne Humphries & Roman Bystrianyk. A rather mind-blowing account of the history of vaccines, containing a great many surprising facts. Visit the site for chapter headings & excerpts & the many great quotations used. The book is reviewed by Dr. Jeffrey Dach here. Dr. Suzanne Humphries: A whole education on vaccines on this page! Several videos included. One on “trailblazers” that includes much about flu shots, unreported vaccine injuries, manipulated vaccine science, whistleblowers, SV 40 in polio vaccine. Also one on smallpox. A short (11-minute) Dr. H. YouTube in another location explains a great deal about the human immune system. Project Pediatric – send book & film to your pediatrician! The posting Vaccines: FAQs has a good list, including some comments about the various documentaries (scroll to the bottom of the post). 22 Must-See Documentaries. Fabulous list! 'Vaccines Revealed' - recent 9-part documentary series; fabulous!! Note: DPT stands for diptheria, pertussis (whooping cough) & tetanus. You'll need to check the sections here on whooping cough (just added) & tetanus also. Sometimes it's DTaP, sometimes it's called DTP. In any case, it's always about vaccination against diptheria, pertussis & tetanus. & there have been major risks with this vaccine - in whatever iteration - for DECADES. EXCLUSIVE: DTaP Vaccine Shatters UFC Fighter’s Family After It Kills Their Healthy Boy (article from Oct. 12/17.) Must-read! There is also a video about the Nick Catone family here). A Shot in the Dark - why the P in the DPT vaccination may be hazardous to your child's health. Super-important book by Harris L. Coulter & Barbara Loe Fisher, published in 1985. - Guide to Immunization Risks & Protection (by Neil Miller) & noted mentions of encephalitis in the book’s foreword (by neurologist Dr. Russell Blaylock), as well as in the sections about chickenpox, flu, DPT & DTaP & Hep A & Hep B vaccines; measles, mumps, pertussis, rubella & the MMR vaccines; rabies, smallpox & yellow fever vaccines. There was also some mention of epilepsy in there (pg. 100). It’s really important that folks demand, & read, the “monograph” or “insert” that comes with vaccines. Medical professionals almost never offer these proactively, so we “patients” need to ask for/insist on them. Here are links to the MMR vaccine monograph. One from GSK. One from Merck. Read them, please, & note the mention of encephalitis (along with a very great many other possible negative outcomes or side effects). These long documents make for some pretty sobering reading. If you don't want your child to be vaccinated, but still be able to attend daycare/public schools in Ontario, you will need to obtain an "exemption" you can provide to the local health unit. There is plenty of information about exemptions on the Vaccine Choice Canada Web site, right here. I just ran across this info about obtaining exemptions in California. The topic of fever comes up when discussing illness, childhood or otherwise. While most of us (including medical personnel) were taught to fear & suppress fevers, it turns out they have an important role in the operation of our immune system. Here are several illuminating items on the subject of fever. Important! Get a quick take on the 2018 flu vaccine picture here. Material is being added to that posting frequently. It's Flu Shot Season! (posting on this blog, October 2017) Many useful links & resources, including YouTube links from doctors who say no to vaccines & give advice on how to prevent the flu. The flu (shot) season posting is being added to continually & has more info than this one does, so do be sure to check it out! Revised version for 2018 is here. The Real Truth Behind Flu Shots (7-minute YouTube with Dr. Mercola). The 3-minute item 'You'll Be Shocked at What the Flu Shot is Really Doing to You!' is also very enlightening!! Plenty of flu vaccine info here. Includes a YouTube link to CDC saying they no longer recommend the flu mist vaccine. Adverse events following HPV vaccination, Alberta 2006-2014 (Pub Med item, 2016) "In Alberta, Canada, a publicly funded quadrivalent HPV vaccine program began in the 2008/2009 school year. There have been concerns about adverse events, including venous thromboembolism (VTE) associated with HPV vaccines. We describe the frequencies of adverse events following HPV vaccination among Alberta females aged 9 years or older and look at VTE following HPV vaccination." Human papillomavirus (HPV) vaccines as an option for preventing cervical malignancies: (how) effective and safe? (on PubMed, Dec. 2013): "We carried out a systematic review of HPV vaccine pre- and post-licensure trials to assess the evidence of their effectiveness and safety. We find that HPV vaccine clinical trials design, and data interpretation of both efficacy and safety outcomes, were largely inadequate. Additionally, we note evidence of selective reporting of results from clinical trials (i.e., exclusion of vaccine efficacy figures related to study subgroups in which efficacy might be lower or even negative from peer-reviewed publications)." “Glyphosate, often sold under the brand name “Roundup,” is the most widely used weed killer in the U.S.” “In a series of articles, my colleague Anthony Samsel and I have been exploring the connection between glyphosate and a number of diseases, including multiple sclerosis, autism, Alzheimer’s disease, and cancer.” – from Dr. Stephanie Seneff in ‘Weeding Out Vaccine Toxins: MMR, Glyphosate, and the Health of a Generation.’ I recommend you go to the Children’s Health Defense site, scroll down right to the bottom & put “glyphosate” in the Search bar. Plenty of relevant info there. Here is another relevant item: Glyphosate + Aluminum + Mercury = Autism, lecture by Dr. Stephanie Seneff, MIT, on YouTube (January 2018). Dr. Seneff interviewed about glyphosate here. "Because of their high degree of toxicity, arsenic, cadmium, chromium, lead, and mercury rank among the priority metals that are of public health significance. These metallic elements are considered systemic toxicants that are known to induce multiple organ damage, even at lower levels of exposure. They are also classified as human carcinogens (known or probable) according to the U.S. Environmental Protection Agency, and the International Agency for Research on Cancer. This review provides an analysis of their environmental occurrence, production and use, potential for human exposure, and molecular mechanisms of toxicity, genotoxicity, and carcinogenicity." 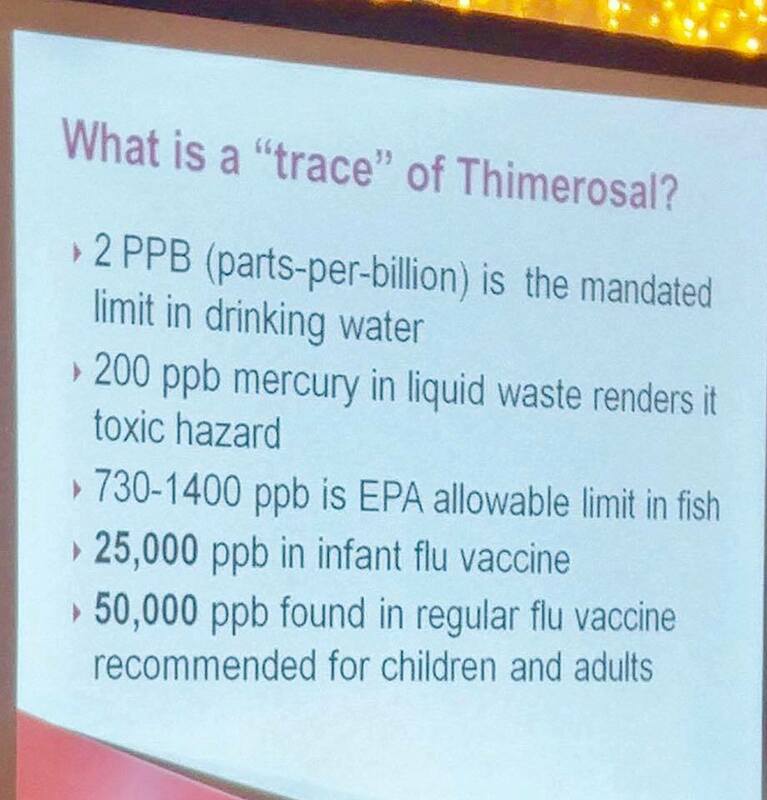 You have to pay attention to mercury exposure, & thimerosal (which is in many vaccines, still, whether in so-called "trace amounts" or not) is a mercury derivative. This is a big deal, reader. I recommend the World Mercury Project site for LOTS of relevant information on this topic. There's also more info below, on this site, in the section on Mercury. Herd Immunity: A False Rationale for Vaccine Mandates January 23/19. 24 minutes of at times rather technical info about herd immunity. Definitely interesting/worth hearing! Tons of good stuff at this location! Studies Show that Vaccinated Individuals Spread Disease. Should the Recently Vaccinated be Quarantined to Prevent Outbreaks? Looks like the "herd" you need to be protected from is the folks who HAVE been vaccinated! Short YouTube, very worth watching! Dissolving Illusions - Disease, Vaccines, and the Forgotten History, by Suzanne Humphries, MD and Roman Bystrianyk is a myth-shattering book about the history of human disease & the vaccines that supposedly put an end to them. Every doctor on the planet needs to read this book. Well ... so do you! At the book's Web site you'll find the full foreword & intro sections of the book, as well as chapter headings, photos and graphs. You will be flabbergasted by the true history of disease & vaccines! Vaccine Illusion - How Vaccination Compromises Our Natural Immunity and What We Can Do to Regain Our Health (short book by immunologist Dr. Tetyana Obukhanych). "Due to the growing number of vaccine safety concerns, our society has been polarized into vaccine advocates and vaccine opponents. However, in the debate over vaccine safety, we have lost sight of a bigger problem: how vaccination campaigns wipe out our herd immunity and endanger the very young. Written by an immunologist, Vaccine Illusion explains why vaccines cannot give us lasting immunity to infectious diseases and how they jeopardize our natural immunity and overall health." 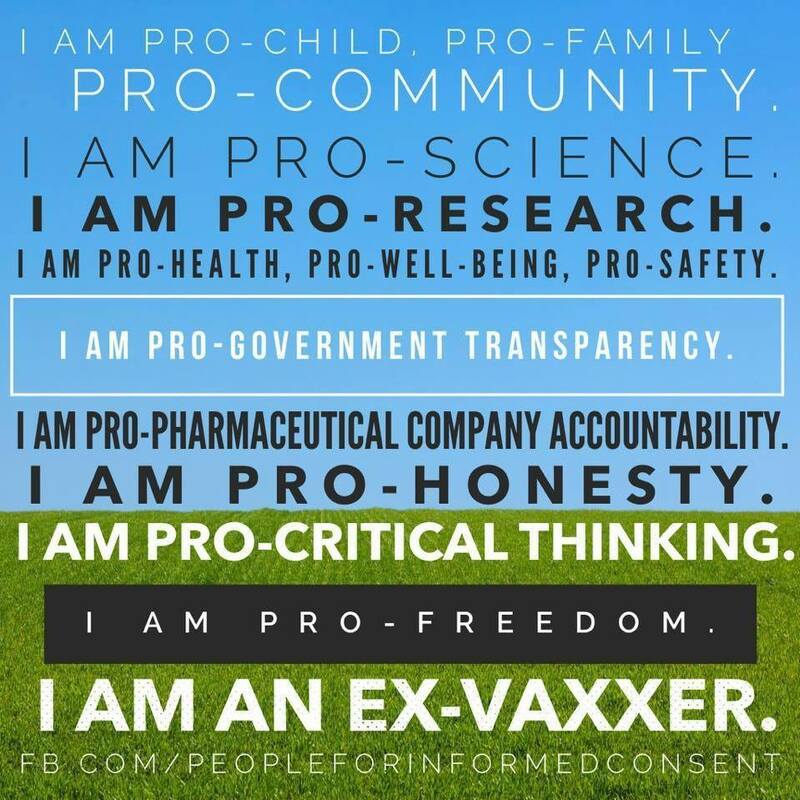 Basic to "informed consent" is knowing what vaccines contain & what their possible risks & side effects are. Since the medical profession does not provide us with this information proactively, we must take responsibility ourselves for learning what we need to know. Beyond that, we do have rights as individuals, & as parents, to choose what is put into our bodies. Here are some links to relevant information about our inalienable right to safeguard our own health. All this is becoming increasingly relevant to be aware of as the movement toward mandatory vaccination gathers steam. (b) he or she is of the opinion that the person is incapable with respect to the treatment, and the person’s substitute decision-maker has given consent on the person’s behalf in accordance with this Act. 1996, c. 2, Sched. A, s. 10 (1). 1. The voluntary consent of the human subject is absolutely essential. This means that the person involved should have legal capacity to give consent; should be so situated as to be able to exercise free power of choice, without the intervention of any element of force, fraud, deceit, duress, over-reaching, or other ulterior form of constraint or coercion; and should have sufficient knowledge and comprehension of the elements of the subject matter involved, as to enable him to make an understanding and enlightened decision. This latter element requires that, before the acceptance of an affirmative decision by the experimental subject, there should be made known to him the nature, duration, and purpose of the experiment; the method and means by which it is to be conducted; all inconveniences and hazards reasonably to be expected; and the effects upon his health or person, which may possibly come from his participation in the experiment. The duty and responsibility for ascertaining the quality of the consent rests upon each individual who initiates, directs or engages in the experiment. It is a personal duty and responsibility which may not be delegated to another with impunity. The Declaration of Helsinki & the UNESCO Declaration on Bioethics also have relevant principles regarding our rights to protect our own bodies & health from forced interventions. The Informed Consent Action Network (ICAN) "is actively pursuing several avenues to improve the health and wellbeing of our population by exposing shortcomings with our vaccine program." & check out the Physicians for Informed Consent. Note also: if you scroll down, you'll find a section on Stories that links to the stories of three families that are very compelling (a tiny-tiny-tiny smattering of the information that is out there, of course). Vaccines (like any pharmaceutical product) come with a great long, wide sheet of tissue-thin paper inside, telling you all about how to administer them, what the possible side effects are, & so on. The medical establishment is not in the habit of providing these to you. You have to ask for them. Even insist on them. But you need to ask for these well BEFORE you allow a medical professional to stick a needle in either you or your child. 'cos there's quite a bit of reading involved, the print is small, & the most dire information is generally saved for the very end. Example: MMR vaccine. Check it out! ** Be sure to read Pg. 6, Warnings & Precautions (where you are warned that "severe allergic reactions including anaphylaxis can occur after administration...") & then Pg. 28, where seizures and inflammation of the nervous system are mentioned. (I find vaccine inserts by going to the Got Your Flu Shot? site, then clicking on 'All Vaccine Inserts' & then clicking on the Canadian flag icon. & then scrolling around to find the particular one I'm looking for. It's an illuminating activity! Full of surprises for the uninitiated, I must say...) Informed consent means becoming informed before you roll up your sleeve! Or bare your child's thighs. & it's entirely likely the medical "professional" who gives you the jab, has not read the information her/himself. It's really very much up to you, Reader! Oh & btw here is the insert for Vitamin K, a shot of which is given to babies at birth, & which you are/were never even told about! Must-see!! ** See also relevant items on mandates in Doctors section, above. Medical Doctors Across the U.S. Speak Out Against Mandatory Vaccination Laws <undated> ** Note: I don’t like this site, for 2 reasons. First of all, for me there is no need to bring God/religion into the vaccine discussion/debate. That just puts me off. Secondly, the posts are not dated. Each post always has, at the top, the date that it currently is, not the date the item was posted. This annoys me. Still, there is some good info in this posting if you can lay aside the annoying aspects to this site. Stop Mandatory Vaccination: much useful information here! 4 minutes on measles. Raises the issue of when "the cure is worse than the disease." *** Be sure to visit Med Science Research to check out the scientific papers there on measles! Robert F. Kennedy (short) - 7 minutes, but a lot covered. Vaccines: Truth Hiding in Plain Sight! MMR-related posting on this site July 9/18. Med Science Research site: check out the science for yourself! Look under M for Measles & for MMR. Plenty there! Vaccine Choice Canada has tons of info on the MMR vaccine / issue. Put MMR in the Search bar, & you're away to the races! “The MMR vaccine has been linked to autism, Crohn's disease, inflammatory bowel disease[142,143] and other serious chronic stomach problems, epilepsy, brain damage including meningitis[145,146], cerebral palsy, pancreatitis and diabetes mellitus[148–150], encephalopathy, encephalitis[151,152], hearing and vision problems, arthritis, behavioural and learning problems, chronic fatigue syndrome, diabetes, Guillain-Barre syndrome, idiopathic thrombocytopaenic purpura, subacute sclerosing panencephalitis (SSPE), leukaemia, multiple sclerosis, and death.” from this article in the North American Journal of Medical Sciences. July 2009. *** See also the Aluminum & Injuries sections; Measles, above; Mumps, below; the section on the 'VAXXED' documentary, & the 129 research papers cited above in the Autism section. & also Tetanus, & DTP (above). ** This section updated on April 11/19. The Polio Vaccination Agenda in Africa Blown Wide Open by Kihura Nkuba <Sept. 2013> Fascinating, unbelievable, shocking - must-hear! ***** Dr. Suzanne Humphries & co-author Roman Bystrianyk have a whole chapter on polio in their illusion-busting book Dissolving Illusions - Disease, Vaccines, and the Forgotten History. The entire chapter on polio can be found here. Neil Z. Miller's book Vaccine Safety Manual - For Concerned Families and Health Practitioners also contains important & surprising information about polio vaccines. “The co-authors scheduled a meeting to destroy documents related to the study. (We) all met and brought a big garbage can into the meeting room, and reviewed and went through all the hard copy documents that we had thought we should discard, and put them into a huge garbage can,” Thompson explained in an affidavit provided in 2014 to a member of a U.S. Congressional committee on science. ** Many super-relevant, related quotes also in the Science Quotes section! Dr. Humphries' book Dissolving Illusions - Disease, Vaccines, and the Forgotten History (co-written with Roman Bystrianyk. The book is discussed here). Simply amazing, the true history of vaccines!? Highwire: weekly TV show with Del Bigtree. So worth watching! 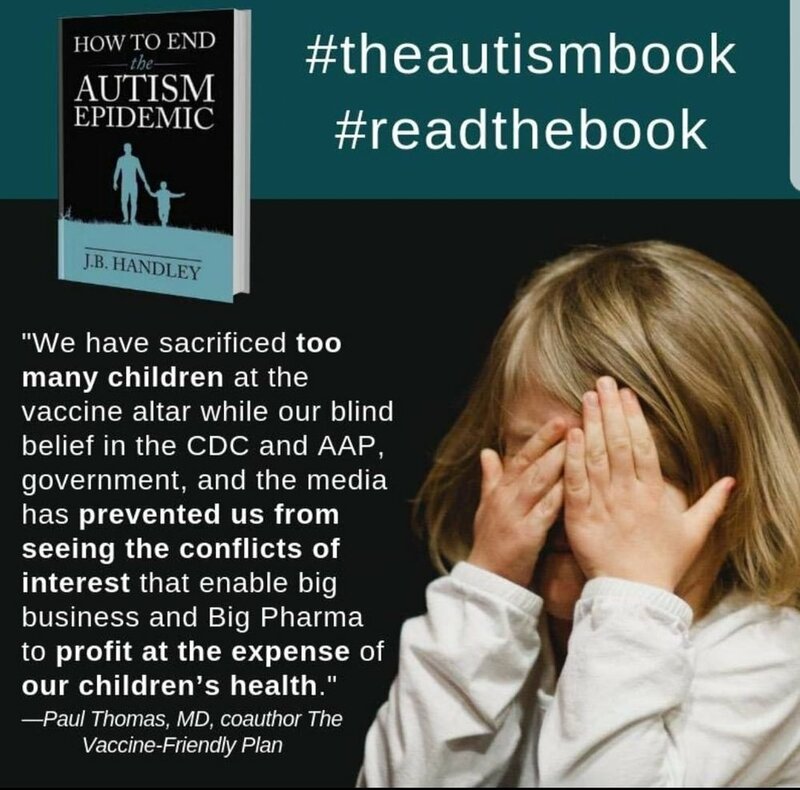 How to End the Autism Epidemic (book by J.B. Handley released in September 2018). A chapter of the book here. RFK & De Niro press conference, Washington D.C. Feb. 15/17. There is scientific info all over this site! Just adding in this section today (Dec. 10/17) 'cos I want to be sure these important Web sites are not missed. MedScience Reseach - as the banner on the site states, "There are thousands of scientific studies in the medical literature on the dangers of vaccines"
Stronger sanctions needed against companies that suppress data “Suppression of science is not an anomaly but is typical of, and produced by, the current economic, political, and social situation, and that is—money talks. It is the system; it is not just a few bad apples,” Dr David Egilman, a professor of medicine at Brown University, Providence, Rhode Island, told a conference this week. Although money was important, there were also other forces at work, he said. “It is broader than money, it's ideology and power. Ideology is a much larger bias than money—much harder to ferret out and think through,” he added. "You're going up against big pharma, you're going up against large industries and they don't like it very much." This refers to the fact that once you're vaccinated, you can "shed" the disease, meaning, you become a carrier & can cause others to get sick. Sheesh; who knew?? Shedding defined. The truth about smallpox & early vaccine history can be found here. Resistance to vaccines goes back to the 1800s! “The Leicester Anti-Vaccination League was formed in 1869.” From Leicester: Sanitation vs. Vaccination. Check it out! It will blow your mind. Many good graphics here. So ... the science is "settled," eh? QUOTE: The CDC and advocates for mandatory vaccination consistently repeat a dangerous mantra that finds no warranted basis in medical science. This monolithic industry, now a massive network of private and government institutions, state senates, and supported by a compliant media, want us to believe that science has finally settled the debate over vaccine safety and efficacy. 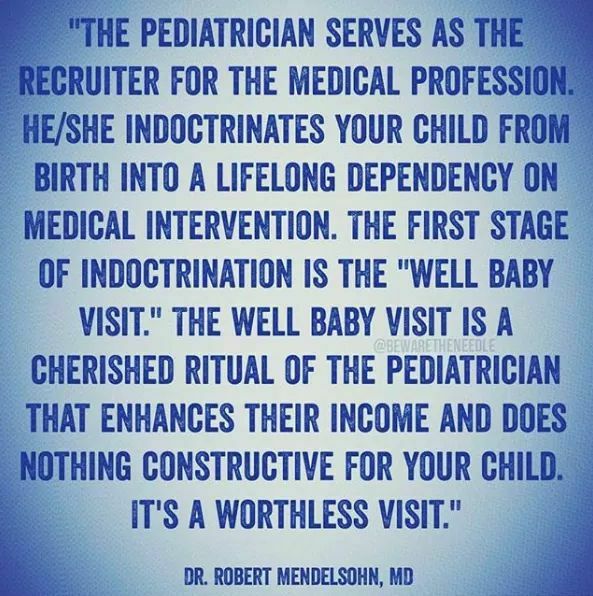 All the data is in, so we are told, and no further research and discussion is necessary because vaccines have been officially ruled to pose no neurological and immunological risk to infants, children, pregnant mothers, adults and the elderly. This official policy is founded upon flawed premises and a primitive understanding about the complexities of the human body and its multifaceted immunological system. And this argument’s fallacy is actually quite simple. Valid science is never settled. The myth of “settled science,” which is especially endemic to the biological and medical sciences that rely on private financial interests, is sheer propaganda. Valid science, on the other hand, constantly seeks new discoveries to acquire further knowledge and greater understanding. The pursuit to fully comprehend the complexity of our biological, immunological and physiological systems, therefore, is in perpetual infinite regress. Today’s justifications for medical intervention, whether by drugs or vaccines, eventually become tomorrow’s barbarities as science further penetrates the hidden functions and operations of the human organism. Hence valid medical research should elicit new questions and not settle upon incomplete facts that are then proselytized as universal truths. A medical science that refuses to ask new questions and settles upon disputed beliefs to sustain an industry’s financial portfolio is Scientism, a quasi-faith-based creed now institutionalized to promulgate repressive laws. These laws then advance Scientism’s authority. Unfortunately, today this accurately represents the sad state of vaccine research and vaccination policy. Modern vaccine science, and conventional medicine in general, has morphed into a new fascism, a rigid doctrine that has sacrificed the foundations of scientific integrity on the altar of institutional greed, privilege and profit." Read the rest of this article here. Scientist/researcher Theresa Deischer, PhD. on stem cell research & the use of aborted fetal tissue in vaccine lines. 38 minutes, edited version. 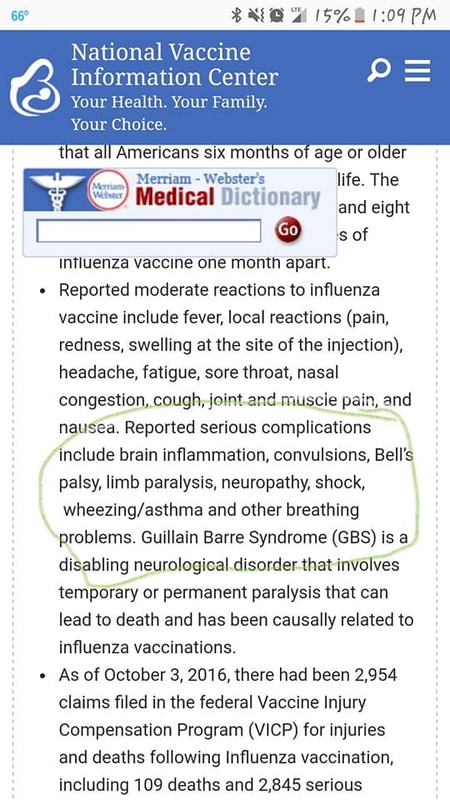 ** there are simply tons of personal stories; please be sure to look under the Injuries heading to find multiple sources for families' vaccine injury stories. Learn the risk.org site has a section on SIDS. Very disturbing indeed. Best to check it out. Vaccines Linked to Sudden Infant Death Syndrome (SIDS): Evidence - read what Dr. Russell Blaylock (a neurologist) has to say. VAERS info with many "sudden" deaths listed, post-vaccination. Bear in mind, it is estimated that only 1-2% (yes, 1-2%) of vaccine injuries ever hit the VAERS reporting system. 98-99% of the time, medical professionals insist there is no connection with vaccination, & do not record the injuries as such. 'Undetermined.' Recent article (Nov. 2017) fails to even mention vaccines! *** See also the section on DPT, above. & the section on Whooping Cough, below. Good quote: “You couldn’t even construct a study that shows thimerosal is safe,” says Haley, who heads the chemistry department at the University of Kentucky. “It’s just too darn toxic. If you inject thimerosal into an animal, its brain will sicken. If you apply it to living tissue, the cells die. If you put it in a petri dish, the culture dies. 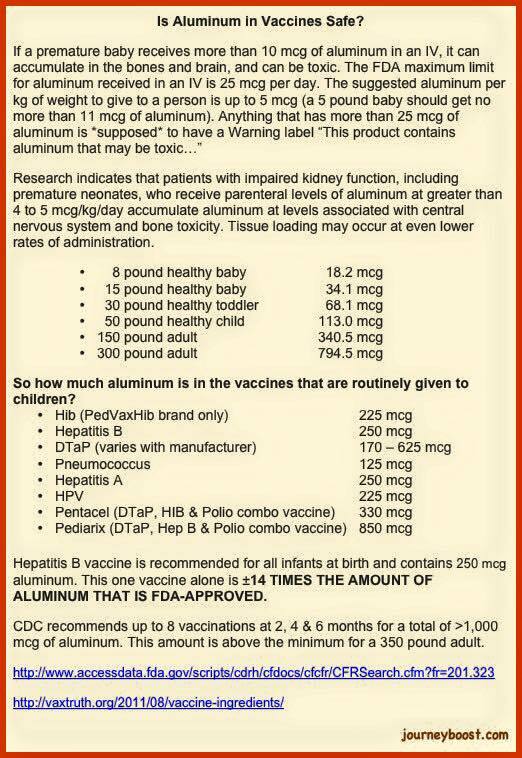 Knowing these things, it would be shocking if one could inject it into an infant without causing damage.” - from this article on the World Mercury Project site. First Do No Harm - a parent's story that first appeared in Narrative Inquiry in Bioethics, Volume 6 , Number3, Winter, 2016, pages 168-172. If I could address Autism One, KP Stoller (MD) "But, be there, or not, here’s what I’d tell you… I say “so-called” autism epidemic because I don’t like to use the word “autism” at all. It means nothing – it is a made-up word by those that didn’t understand that autism is (for the most part, because there are always exceptions), an environmentally triggered brain injury. And if that is what it is, then that is what it should be called – so children can have at least half a chance of getting interventions that might help them." Interview with a professor of Medicine (who teaches medical ethics), nephrologist (kidney doctor who also focuses on palliative care) & who knows 12 children with autism; simply a must-see! Science vs. Scientism: a letter in response to TVO's March 14th episode on ‘Science, Society, and Politics.’ Letter written March 18/17. Vaccination is not a medical issue: "This agenda becomes evident when we witness the amount of financial and other resources dedicated to tracking compliance, rather than tracking safety and effectiveness. Our health units are not monitoring whether vaccinated children are healthier than unvaccinated children. They actually show no interest in this data. Instead they invest millions of dollars into tracking and enforcing compliance, and punishing those who do not comply." ** see also many other sections in this A - Z collection for CDC goings-on, doctor testimony, lawsuits & Merck troubles, pharmaceutical scandals, & vaccines (below). This is just a tiny smattering of items relevant to this issue of trust. is apparently dangerous to babies - really dangerous - after vaccination; I've heard this said repeatedly. New section as of Feb. 21/18. I'll need to return & insert additional appropriate material here. Campaign to Restore Child Health: Parents Speak Out on Vaccine Injuries Short YouTube. Mother speaks about her son's vaccine injury, & autism, & her experience with the U.S."vaccine court." Whopping Vaccine Injury Payouts for U.S. Fiscal Year 2017 Released. "Vaccine injury payouts currently stand at over $142 million dollars. You read that right. That covers the 377 cases that were thus far successful in obtaining compensation in FY 2017 through the heavily biased (to put it politely) system allegedly in place to redress damage done by vaccines in the USA." Combining Multiple Childhood Vaccines is NOT Safe, According to Article in Journal of American Physicians and Surgeons (Summer 2016) The article itself. Simply tons of scientific papers listed here! Uncensored: MMR fraud exposed by people behind Vaxxed: From Cover-Up to Catastrophe 31 minutes. Good for understanding what investigative journalism means, & why most people have never even heard that there is a 16-year cover-up by the CDC (mainstream media do not report on it!). Yeah, I know, I didn't know anything about the Vitamin K shot given at birth either (it is not a vaccine, but an injection. One they don’t tell you about). Have a look at the product monograph or "insert." Reading vaccine "inserts" is a must-do! See also the Inserts section above for more on how utterly essential it is to read this material! There is an 18-minute interview here with a young Mom, about the Vitamin K shot. If you watch it, other YouTubes on that topic will also come up. The 112-Year Odyssey of Pertussis and Pertussis Vaccines—Mistakes Made and Implications for the Future <Feb. 22/19> I located it here. 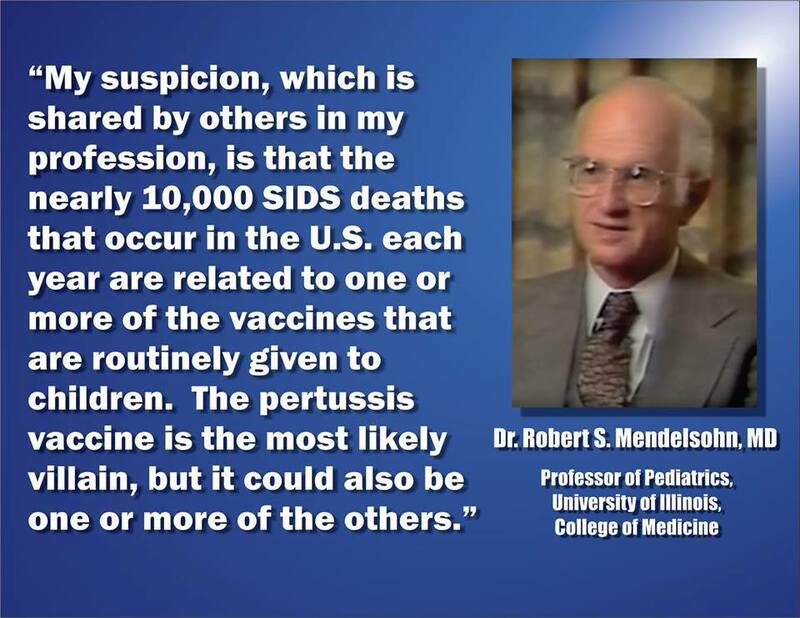 The dangers of whooping cough vaccination (Dr. Gordon Stewart). This site is a MUST-SEE. Holy smokes. This episode of HIGHWIRE discusses the pertussis issue extensively. Pretty mind-blowing. Many items about Zika if you do a Search on My Incredible Opinion YouTube Zika. “Please ask questions and make the time to go see the documentary Vaxxed. Form your own opinions, do your own research, and then talk to your physician. Demand to hear from Dr. Thompson, pass this information along to your loved ones, and start these conversations. We all deserve answers, and this is the only way to get any.